I am such a huge fan of this series. After reading and loving the first book Searching For Someday, I couldn't wait to get my hands on this. I knew it would be an emotional one, as it is told in the first book that Kennedy has always struggled with her weight. 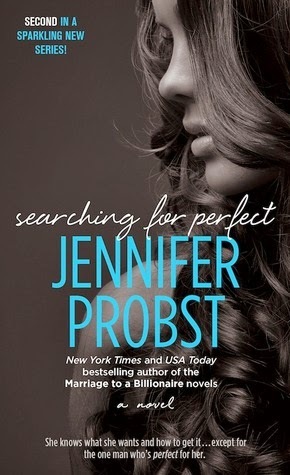 I loved Searching For Perfect because it just has such a good message and it really leaves you feeling hopeful that you can overcome the darkness that keeps you from living life to the fullest. Pacing: Extremely well-paced. The relationship between Kennedy and Nate is not rushed and I felt Probst handled it very realistically. I also felt Probst did a great job connecting some of the previous plot lines from the first book to this one. Storyline: As I mentioned above, we met Kennedy in the first novel and I really loved her. Where Kate was more timid and shy, Kennedy is really outgoing and fun-loving. She is funny and I loved watching her interact with Nate. Nate is a train wreck. He is looking for love and marriage, but doesn't quite know how to go about it. He attends a speed dating session where everything that could go wrong, does. Kennedy zones in on him and knows she has to do something. She loves helping people and she sees Nate and knows she can help turn his life around. The problem? Nate is fascinated by Kennedy. He sees her at the mixer and desperately wishes someone like her would notice a guy like him, but knows there's no way that would ever happen. Nate's undergoing transformation is hilarious to witness. He was raised by his older brother, Connor, who is pretty jaded and cynical about love and has offered his 'advice' to Nate. Between Connor's advice and his speed dating experience, he has NO idea how to talk to a woman. Kennedy and Kinnections step in and plan to find Nate his HEA.... unknowing that he may have already found her. I love how Probst gives us a little bit more each time about Kate's friend, Gen and the Mackenzie family. I am curious as to what is going on there, as she is engaged to be married and does not seem like a happy bride at ALL. We once again get to see the other characters from the Billionaire series very briefly and that made me smile. Characters: As I said, Nate is a hot mess. He is blunt, direct, and says what's on his mind. Obviously, that can have its good and bad effects. He is an aerospace engineer and works long hours and hasn't had time for relationships. However, he wants that to change and find someone to spend his life with. He has done his research on what women want and like, but between his brother's misguided advice and other things he picks up on, he just doesn't have the social skills to woo a woman. His directness is what gets to Kennedy though. He isn't afraid to dig deeper with her and the way he innocently does it, is actually endearing even when you want to be pissed off. He is attracted to Kennedy from the get-go, but feels he could never capture a woman like her. Yet, the more time he spends with her, the more he realizes his feelings for her aren't going away, but only getting stronger. Kennedy doesn't do love and marriage. She's a right now kind of girl, always protecting herself first and foremost. She dealt with severe bullying in school when she was younger and while she has faced those demons head on, they do still linger and remind her of the cruel punishment she once endured. The way Nate pushes and challenges her ends up strengthening her and he sees her for who she really is- beautiful and strong. She doesn't think she's good for him, thus the delicious game of who will cave to who fastest. There are a few scenes that absolutely shredded my heart as we really got to see Kennedy vulnerable and exposed. I loved seeing Arilyn and Kate again and I am really looking forward to Ari's story! They are great friends to Kennedy and aren't afraid to step in when she needs a little 'friendtervention'! Final Thoughts: I loved watching Kennedy and Nate together. They are opposites, but actually have quite a bit in common. They just work together and a piece of my heart died every time Kennedy pushed him away. Nate, while a bit of a mess, is a genuine guy and I really loved him. His and Kennedy's chemistry is off the charts and I was screaming at her to just let go of everything already and be with him! Because when you constantly push someone away, you might just lose them forever. "You're both. Smart and beautiful. On the inside and outside. You don't have to choose one over the other anymore. You can just be exactly who you were meant to be. And I think that's damn perfect." So, I completely forgot about this series and I remember being excited to read it... now I am so mad because clearly you loved this one too and I have been reminded of how great they sound. These characters sounds awesome. Great review! Aww! I'm a big fan of Jennifer Probst and I think I love this spinoff series more than the original! You would really enjoy these Teresa. Especially if you're in need of a YA/NA break. Aww, I know that feeling all too well Magen! I don't always add books to GR or add them to my Excel spreadsheet and then I forget all about them! It's definitely depressing! I do love this series though. Oh Jessica, I want to read this series badly. The story sounds amazing and the characters seem well-developed. Gah! Maybe I can get started next month. Great review, girl! Brandee! These books are so good! I love them so much! I hope you get to start them sometime too!